This system is for any equestrian sport or activity, except for racehorses. It was designed to make the transition from bit to bitless, and not to start horses from zero. I developed a variation of this system for first starting horses that I explain separately, not in this publication. Illustrations by Pabla Ortuzar. The horse to be trained bitless need to be healthy, without physiological pathologies, and without behavior problems. If the horse has mental or physical problems, you need to fix them first, and then apply the system. Except for the problems that are caused intrinsically by the bit, in which case the system is a treatment by itself. The horse that is going to be trained is longed in a round pen. Just a halter and a rope, in both directions. This should to be done without pressure, the intention is to make the horse release energy and get in a calm and relaxed mood. 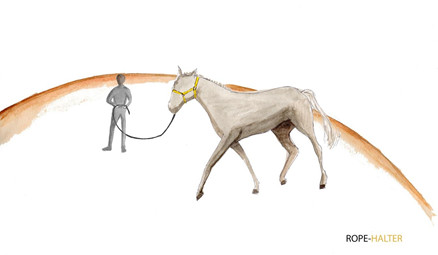 To teach the horse to stop correctly is very important from the beginning.